The only other time in my life when my body has been this tired and confused were those first few days after bringing home a new baby. I have no concept of time, no memory of eating, I haven’t slept for longer than 3 hours at a time and my head feels all cold and floaty, like I’m just awake enough to remember to keep breathing. 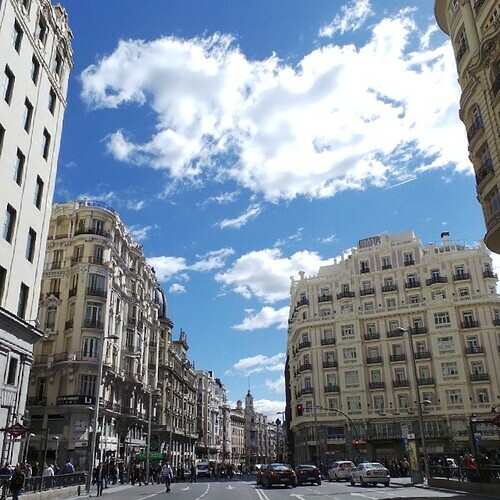 An opportunity came to me through the dozens of various connections I’ve made in this life and that opportunity had me in Madrid, Spain for the last five days. Until last week I had never been to Europe, traveled overseas or been completely immersed in another country. Sure, I’ve made day stops on Caribbean islands and have spent a few wild nights in Canada, but nothing like this. It’s very isolating to be in a whole new place by yourself, a place where you barely speak the language and around every corner is something you’d never thought you’d see in your lifetime. I know, *EYEROLL* it’s so hard traveling to Europe, Casey. Cry me a really pretty European river lined with little tables and blossoming trees. Gross. I’m just having one of those moments, I’m so thankful and grateful and happy and pleased with myself that I finally found something I’m really good at. Now if you’ll excuse me. I need to sleep for a week. I have no idea how people travel to Europe with kids — I can assure you that if mine had been with me this weekend I would have lost one. Loving the new blog design!! And I can’t wait to hear more about your trip– I’ve been loving the IG pictures. Now you just need to go to Paris. I’ve been to Madrid and it just pales in comparison. Still, your IG pictures are lovely. When we were over there, we always told people to plan for no less than 2 weeks, 3 preferably. It takes at least a week to get over the jet lag and be able to think straight. I have never understood how people are able to truly enjoy jetting back and forth all the time, although if 5 days is all you’ve got, go for it. Because seeing the world is worth it. Also, if it mmakes you feel any better, I always found the adjustment easier crossing the Atlantic East to West, so hopefully your body clock will reset quickly. Also – Venice. I’ve been to London, Copenhagen, Berlin, Paris, Rome, Naples, all of Switzerland, and a million places in between, but my all-time favorite picture taking city is Venice. One of the possible places we could get stationed next is 30 minutes by train from Venezia. If we get that post, you *MUST* come. Also- can you write much much more on these travels? How did you get a gig that does this? What has been your favorite part? How are you doing being away from the girls and Cody? More more more! Traveling with kids in Europe is amazing. My husband and I went to Europe every year, and after we had our daughter we were at a loss for what to do. We took her when she was 3 and it was like traveling with royalty. Wherever we went, people were giving her gifts, attention, balloons, anything we wanted. They love kids, and traveling with kids is very common. Most hotels offer great family rooms, and even play areas in their dining areas. It was the best trip we had ever taken. Try MOVING to FRANCE with two little ones!!!! Not the comforting post I was looking for. After it’s all said and done hopefully I come back with at least a cat, maybe even a kid or two. I went to Barcelona last summer and will definitely go back. Looks like I’ll need to add Madrid to the list as well. Thanks for sharing and I truly hope the sunshine and blue skies healed your heart. Your Indy friends are proud and happy for you … and all fighting for who gets to sneak away in your suitcase next time. Will be adding “Don’t lose a kid.” to my list of things to do when we’re in Spain this summer. Thanks for sharing the city and country I love with everyone. LOVE Europe! We haven’t done it with kids, but key is definitely pretending you’re in the time zone the minute you step on that plane. So if it’s the middle of the day, but night where your traveling? Sleep so you can function like a local. And a small nap is a great way to stave off the crazies! I have many memories of Europe, much love. Glad you enjoyed yourself! Hope to hear (and see) more from you in the future! Keep up the good work! Love ya!